We've made 2016 the year of the landscape. 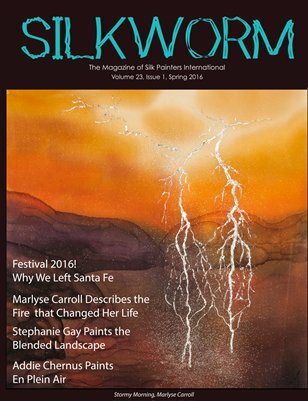 The Silkworm will explore the various landscapes. In the current issue, we explore nature's violent side with Marlyse Carroll who writes about her experiences surviving and helping others to emotionally, spiritually and artistically express themselves in the wake of the catastrophic bush fires in Australia which changed many lives. Stephanie Gay from England explores a lighter topic, painting town and country on silk. Addie shares her secrets for painting en plein air. Brecia Kralovic-Logan returns to inspire, taking on the topic of the interior landscape. Stay turned as we explore a variety of landscapes this year.